Spanish painter. He entered the studio of Juan Carreño de Miranda in Madrid as pupil and assistant and remained on close terms with his master, for in 1666 he was still living in Carreños house. Palomino praises his modest and studious temperament and laments that he died young. Few works by Cabezalero survive; although little is known of his development, his paintings are of high quality. His signed St Jerome (1666, Meadows Museum, Southern Methodist University, Dallas) is a good example of his adherence to Carreño and their common admiration for Anthony van Dyck. The large canvases of scenes from the Passion (1667-8; Madrid, Chapel of the Venerable Third Order of St Francis) are another tacit tribute to van Dyck, whose figures and sense of composition Cabezalero was able to absorb and mark with his own personality. They show his characteristic system of modelling by means of broad planes of light, with strong outlines. He was an excellent colourist, preferring light, intense colours with individual tones of blue, orange-yellows and vibrant, pearly whites. 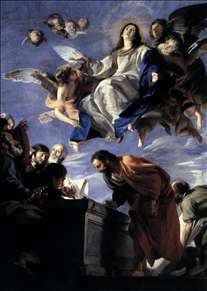 The Assumption of the Virgin (c. 1670; Madrid, Prado), formerly attributed to Mateo Cerezo, has been recognized as an important work by Cabezalero. See more details about "Assumption of the Virgin"